Cantor’s Driving School offers driving lessons and driver training in all areas of Phoenix, Arizona. Over 50,000 drivers have learned to drive with Cantor’s Driving School. Are you our next safe driver in Phoenix? 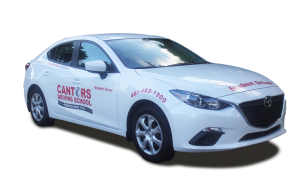 Cantor’s – The Driving School That Gets Results® in Phoenix. When taking driving lessons in Phoenix, Cantor’s Driving School provides driver training on main roads such as Piestewa Freeway/AZ 51, Phoenix-Wickenburg Highway/US 60 and AZ 60. For freeway / interstate driving lessons, I-10 and I-17 are utilized. Driving lessons can be conducted on local roads in Phoenix like Thomas Rd, Van Buren Rd, Buckeye Rd, McDowell Rd, 19th Ave, Northern Ave, Broadway Rd, Baseline Rd, Thunderbird Rd, Deer Valley Rd, and Cave Creek Rd. The Phoenix areas covered include North Mountain Village, Enchanto Village, Camelback East Village, Maryvale Village, Estrella Village, South Mountain Village, Paradise Valley Village, Desert Ridge, Desert View Village, Deer Valley and Central City. Teen drivers can be picked up at any of the public or private schools in the Phoenix area, including Central High School, Arcadia High School, North High School, Northwest Christian High School, St Mary’s Catholic High School, Greenway High School, Camelback High School, Shadow Mouthan Paradise Valley High School, North Canyon High School, Bourgade Catholic High School, Washington High School, Valley Lutheran High School, Maryvale High School, Southern Mountain High School, Desert Vista High School, Thunderbird High School, Alhambra High School, Brophy College Preparatory, Carl Hayden High School, Cortez High School, Metro Tech High School, Mission Academy High School, Pinnacle High School, South Pointe High School, South Ridge High School, , Sunnyslope High School, Westwind Preparatory Academy, Franklin Police and Fire High School High School, and Xavier Prep. Zip codes covered include: 85003, 85004, 85006, 85007, 85008, 85009, 85012, 85013, 85014, 85015, 85016, 85017, 85018, 85019, 85020, 85021, 85022, 85023, 85024, 85027, 85028, 85029, 85031, 85032, 85033, 85034, 85035, 85037, 85040, 85041, 85042, 85043, 85044, 85045, 85048, 85050, 85051, 85053, 85054, 85083, 85085, 85086, 85087, 85226, 85251, 85253, 85254, 85255, 85281, 85282, 85283, 85301, 85302, 85304, 85305, 85306, 85307, 85308, 85310, 85331, 85339, 85340, 85353, 85383, 85392. Cantor’s Driving School serves the Phoenix Arizona / Maricopa County area. To get started with driving lessons, call us at 480-482-1900 or use our convenient contact form.